The rebels of American Idiot thundered the stage for their set next, which I think was a mistake in planning, putting the day’s only new Broadway shows in succession. Happily though, all were in attendance, including John Gallagher Jr. and Michael Esper (Stark Sands was out, he has missed a few performances this week). As usual, Idiots brought intensity to their opener, “American Idiot” (predictable, but appropriate). They followed that with a lesser-performed number, “Last Night On Earth,” which displayed the marvelous (and underappreciated *cough* Tonys *cough*) Tony Vincent. The gorgeous Rebecca Naomi Jones (looking newly svelt) led the ladies in a deliciously feisty “Letterbomb” to close out the set. It was clear from the crowd’s response that most in attendance were there to see this showcase. After Green Day’s musical finished, the tired musicals of the Great White Way came plodding on stage. “Lay All Your Love On Me” was a completely disposable performance. Beth Leavel belted a genuine “Winner Takes It All,” which would have closed the set on a sturdy note. But no, the cast had to trudge through “Mamma Mia” (without any mics visible on stage. Hmmm…) and “Dancing Queen” for the bajillionth time. As the actors exited the stage, the announcer proclaimed, “I didn’t miss Meryl Streep or Pierce Brosnan at all!” which isn’t saying much. For the last performance of the season, West Side Story sent Matthew Hydzik to perform “Something’s Coming,” which he did sweetly. Pinch-hitting for Josefina Scaglione, Haley Carlucci joined him for “Tonight,” which sounded great, but included too much dialogue. The announcer—quite pleased with cracking himself up—followed their elegant performance with a boisterous, “Muy caliente!” that would make any gringo blush. So brings the 2010 season of Broadway in Bryant Park to a close. It really was a great season with strong performances, but there are lessons that I would like to see realized in 2011. A-list stars should realize the importance of this event and allow their pretty faces to soak up some of the glorious, afternoon sun. Although, huge credit goes out to the many understudies that stepped up this season and nailed their performances. There needs to be more balance in the number of songs each show performs, ideally with priority going to the newer productions. And finally, directors need to make greater use of the Bryant Park stage. Too many shows have sent their leads to stand still in front of a mic stand. Let’s get a little creative here. If these improvements can be made, this summer series will surely remain to be one of the best tidings of the hot weather, right next to lemonade. 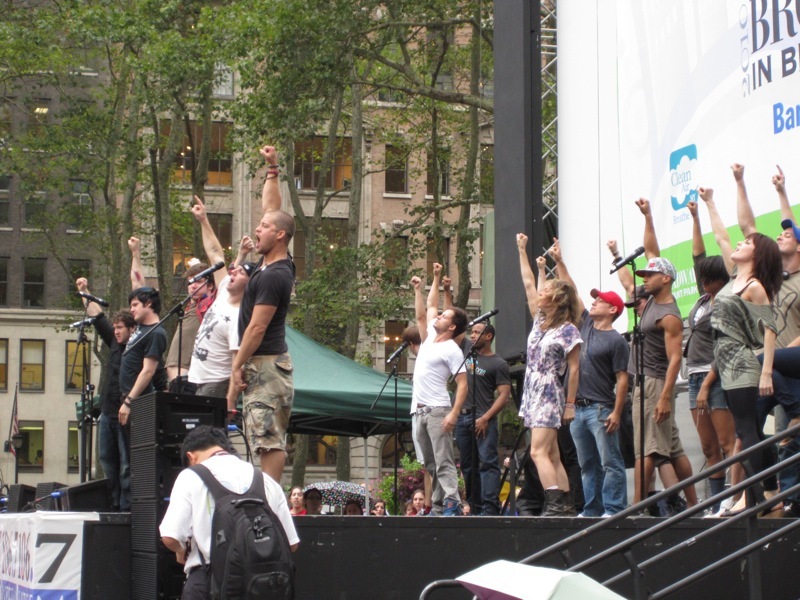 Are you sad Broadway in Bryant Park is over, Rushers? Which week was your favorite? What improvements, if any, do you think should be made to the concert series? Leave your summer thoughts in the comments below! I take offense to “newly svelte” as referring to Rebecca Naomi Jones. If she wasn’t “svelte” before, I guess most of us are fat pigs. @Kym: You didn’t see her yesterday. I’ve never seen her this tiny. I made it yesterday just in time for the American Idiot performance and I thought the same thing about Rebecca Naomi Jones, Jesse. It’s probably because the show is one big workout. I was really disappointed that Eric William Morris didn’t go on for Sky in “Lay All Your Love On Me.” He’s not a big star, so I figured he’d be there. The highlights for me were “Last Night On Earth” and “Something’s Coming.” Matthew Hydzik was so much better than Matt Cavenaugh. What impact has Broadway in Bryant Park had on ticket sales? I went to Broadway in Bryant Park last summer during one of my trips to New York and it was fun. It’s free – what’s not to like?! My guess is the A-list stars would be there if the producers thought it would sell tickets. But I’m not sure listening to a couple of songs for free in the park during your lunch hour would translate into ticket sales. I don’t think that for a lot of people, Broadway tickets are that kind of purchase. Unless they’re die-hard theatre fans, in which case they’ve probably seen the show already.